Hailing from Alberta, Canada guitarist Brian Hughes resides after a stay in Toronto now in Los Angeles. His musical life is a prove for diversity. Tagged as jazz guitarist he also performed with world renowned vocalist Loreena McKennitt, Celtic music legends, The Chieftains or Greek recording artists Evanthia Reboutsika, Yannis Kotsiras and Panayotis Kalantzopoulos. His solo career can be described with his albums Between Dusk and Dreaming (1991), Under One Sky (1992), Straight To You (1996), One 2 One (1998), Shakin' not Stirred (1999), Along the Way (2003), Live (2007) and Fast Train To A Quiet Place (2011). On his new album Hughes is joined by Matt Rohde, keyboards, Tal Bergman, drums, Ron Powell, percussion, and Rufus Philpot, bass. All songs were written and composed by Brian himself. The musical image of a Fast Train often stimulates musicians. Chris Standring's Fast Train To Everywhere, Gerald Veasley's The Fast Track, Saltaire's Skyline Express, Ken Navarro's Dreaming Of Trains, there are many examples to find. Brian Hughes is searching anew the nearness to the early work of Pat Metheny, which makes his performance very appealing. A Blanket Of Stars is another shining sign of Brian's undisputed affinity for Metheny's style. If you ever will come to Brazil, don't miss the city of Salvador da Bahia, where carnival is not a seasoned festival, but a lifestyle. Would You Like Fries With That My Dear? expresses exactly that attitude of joy. With the slow You & I Hughes adds a song for the league of hopeless romantics. The fast-paced Gotcha! turns out to be Brian's showpiece. Breathtaking, captivating and infectious. With his glistering guitar and with Matt Rohde's rumbling treat of the Hammond B3, both tie up a Super Tight package. On the Latin flavored Café Sin Nombre all members of the group are rocking. This way Salsa has to sound. The Gift combines Brian's stellar performance on acoustic guitar and sitar. To A Quiet Place is a piece full of sensitive melancholy. Hallelujah is played with such an empathy, it's just celestial. In addition Brian added radio edited versions of Fast Train and You And I to the album. I am not really sure, if that still makes sense in our time. 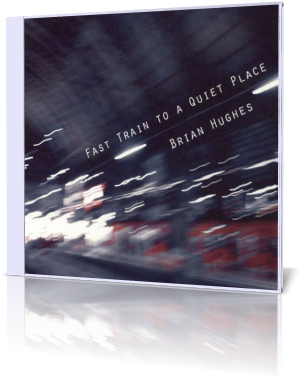 With Fast Train To A Quiet Place Brian Hughes delivers music that Pat Metheny refuses the thirsty crowd since years. But we shouldn't pigeonhole Brian's music to a Metheny-like style. This guitarist has far more facets and expressions.